The Extricator II provides the rescue professional with all of the capabilities of the "Original Extricator" combined with speed, additional force application and ease of operation provided by air over hydraulic tool operation. The air chisel rapidly cuts thru vehicles and up to 1/4" steel plate. The Come-A-Long and Chain Set provide the capability to raise or pull up to 2 tons. THE BOSS gives you a truly one person operated rescue tool. THE BOSS is an excellent tool for rescue squads to provide a complete vehicle extrication system or to complement existing rescue systems . THE BOSS has a huge Eleven Square Inch Serrated Pushing Surface designed to distribute force evenly over a large area in door openings and pushing other areas to minimize metal tearing. THE BOSS provides a thinner jaw thickness, just 3/4 inch at the closed tips allowing deeper penetration into the door opening. THE BOSS uses an air over hydraulic pump providing virtually silent operation which permits better on scene communication without the need for yelling, shouting or hand signals. THE BOSS is excellent for use inside vehicles with its compact size, measuring 3 3/4"High x 10 1/2" Wide x 19" Long. 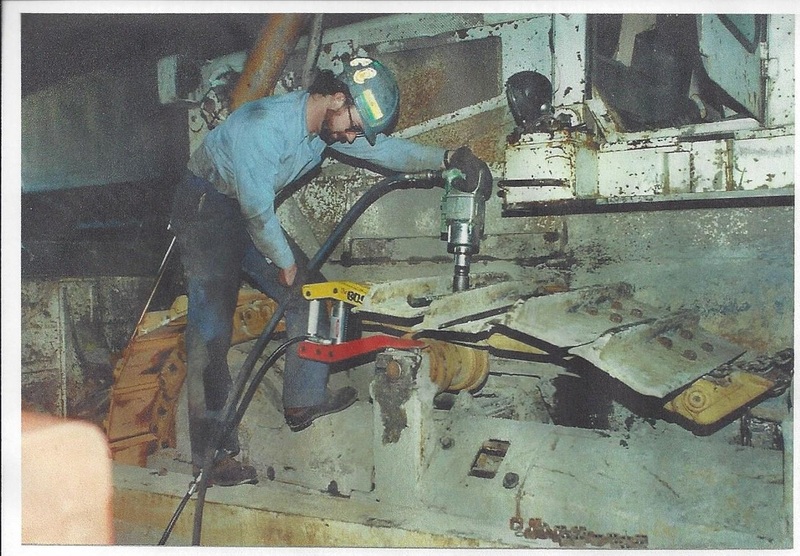 THE BOSS is the ideal tool for auto and aircraft extrication, industrial machinery releases and mining accidents. The air/hydraulic or hand operated hydraulic pumps make it ideal for use in hazardous areas. THE BOSS has no dangerous exhaust fumes making it ideal for use in confined spaces. THE BOSS is designed to quickly and efficiently operate outdoors, indoors, in confined spaces, in hazardous atmospheres or underwater. THE BOSS can readily be used as a totally self contained spreader using an optional hand operated 10,000 P.S.I. dual stage hydraulic pump for those situations where external power sources are inappropriate or unavailable. THE BOSS provides forged high strength steel, heat treated arms with an unprecedented lifetime warranty. THE BOSS utilizes a high tensile strength aircraft aluminum hydraulic cylinder and knurled handle for ease in handling and reduced weight. THE BOSS is MADE IN USA. SPREADING/LIFTING CAPACITY: 12,000 pounds of spreading force at the closed tips, the force increases as tips open. OVERALL HEIGHT AT HANDLE: 10"
Warranty: One year on all components except the spreader arms which have an unequaled lifetime warranty. 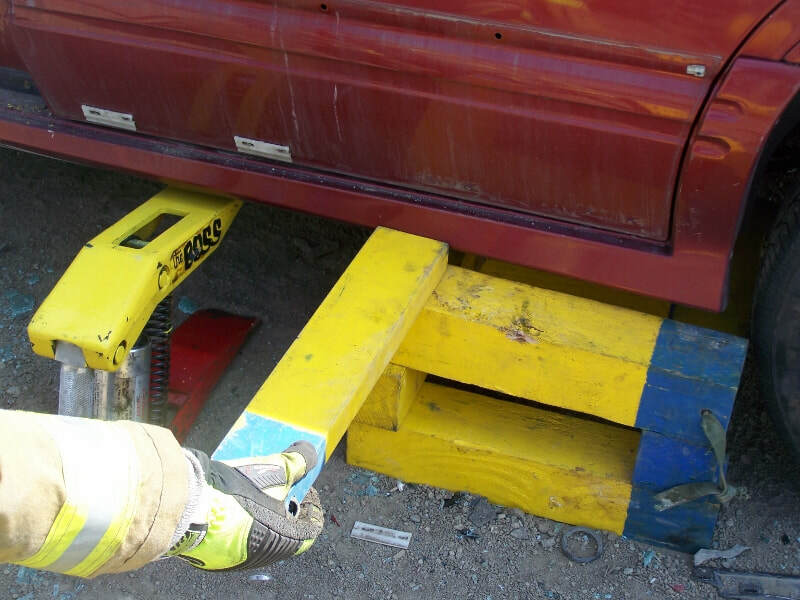 The “BOSS” hydraulic spreader is an excellent tool for opening jammed and damaged doors on vehicles, aircraft and buildings. The arms are long and narrow to enable deep penetration (3/4” total jaw thickness at the tips when closed, opening to a full 12 1/2”). The large pushing surface is designed to distribute force over a greater area reducing metal tearing while providing greater spreading and lifting stability. The “BOSS” hydraulic spreader is very flexible in its uses, it has the ability to provide 12,000 lbs of spreading or lifting force at its closed tips. The spreading force increases as the arms open. The compact size and massive power make it an excellent compact spreading tool that works easily inside vehicles, aircraft, in confined spaces or underwater. This unit is remote controlled, allowing the operator to utilize either hand or foot operated controls. If need be, the operator may position the “BOSS” spreader inside a vehicle or under an object and a fellow rescuer can operate the controls from a distance of up to 6 feet away with the supplied hydraulic hose. For those situations where the control must be operated from a greater distance, optional longer hoses are available. Shipping weight: 150 lbs. Ships via FedEx Ground. from 2215 PSI to 5500 PSI without adjustment. The C-2A, 2 Ton Come-A-Long is the only unit that provides a full 10 feet of lift without requiring 2 wraps of cable be retained on the drum. 9/32" Grade 100 Chain Slings each chain sling is individually Proof Tested to ASTM, OSHA and NCAM. Standards. Providing a Working Load Limit of 8,200 lbs. 1 ea. 5 foot long chain sling. 1 ea. 12 foot long chain sling. 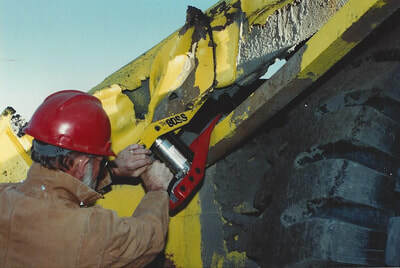 The “BOSS” hydraulic spreader is an excellent, versatile tool designed for opening jammed and damaged doors on vehicles, aircraft, buildings, and elevators or raising heavy loads in industrial entrapments or collapse rescues The arms are long and narrow to enable deep penetration into the material to be spread, (3/4” thickness at the tips when closed, opening to over 12”). The 11 square inch pushing surface, the largest in the industry, is designed to distribute the force over a greater area which reducing point loading, or tearing of metal while providing better spreading and lifting stability. The “BOSS” hydraulic spreader is very flexible in its uses, it provides you with its ability to produce 12,000 lbs of lifting or spreading force at its closed tips. The force increases as the tips open. The compact size makes it an excellent tool for use any rescue environment, inside vehicles, aircraft, or underwater, and its massive power and compact size The “BOSS” fits easily into confined spaces. This unit is remote controlled, allowing the operator to utilize either hand or foot operated controls. 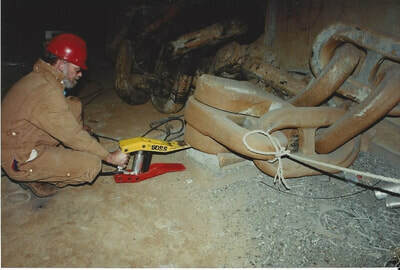 The operator may position The “BOSS” spreader inside or under an object and a fellow rescuer can operate the controls from a distance of up to 10 feet with the supplied air hose. For those situations where the controller must be operated from a greater distance, longer hoses are available as an option. The hand tools included in this set are the most commonly used in vehicle extrication and aircraft rescues. Included in the set are the 12" adjustable wrench, 8" adjustable wrench, 9" flat tip screwdriver, 4" Phillips screwdriver, 10" adjustable pliers, metal cutting shears, bale hook, hook blade knife, and a hacksaw with 6 blades. 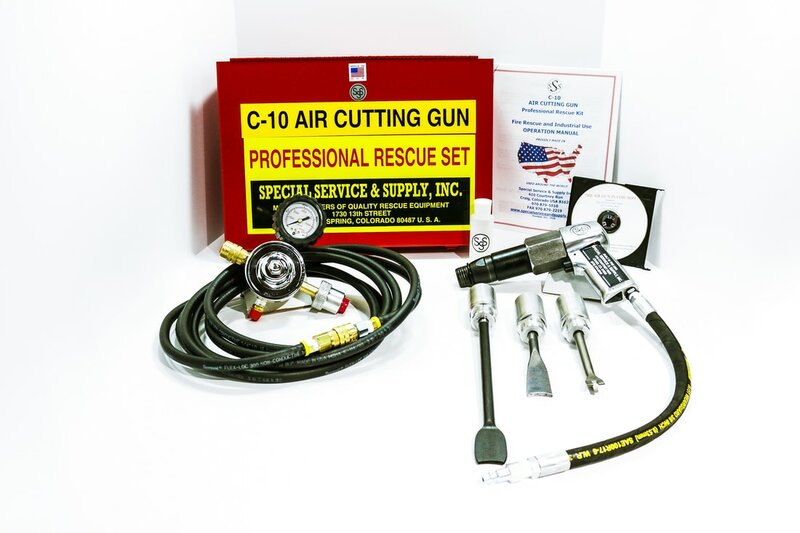 The AIR CUTTING GUN™ SET, MODEL C-10 is the "original" air chisel designed for rescue and is included in this aircraft rescue set to provide easy, rapid cutting of sheet metal, aluminum and steel plate up to ¼” thick. The C-10 Air Cutting Gun may be operated from any SCBA air cylinder from 2250 P.S.I to 6000 P.S.I. or air cylinder equipped with a CGA valve, without the need to adjust the regulator. CYLINDERS WITHOUT THE NEED FOR ADJUSTMENT. · FOOT LONG AIR HOSE WITH 300 P.S.I. WORKING PRESSURE. BODIES IN A MATTER OF SECONDS. Often imitated, but never duplicated, the C-10 AIR CUTTING GUN is the most powerful air chisel in its class and carries a 2 year warranty, the longest in the industry. The air regulator is 100% factory tested and comes with an unprecedented 7 year warranty! 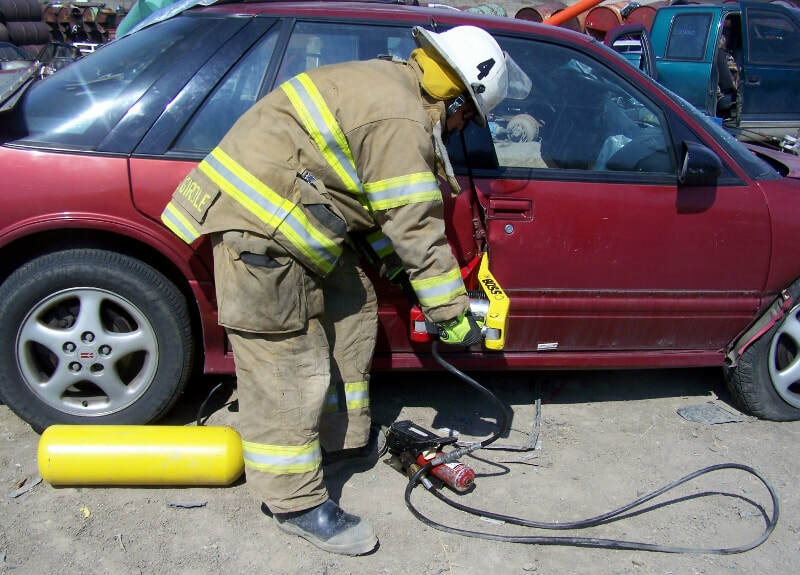 This air cutting gun was specifically designed to meet the rugged demands of Emergency Squad Training Institute for rescue and extrication. This is not a “muffler shop air hammer”. Pulling or lifting operations are accomplished by using the C-2A Rescue Come-A-Long or using the C-1 Rescue Chain Set and the C-2A Rescue Come-A-Long in combination. Model C-1, Rescue Chain Set™, is comprised of two special high strength chain slings, constructed from Grade 100 chain and grade 100 attachments to form a 5 foot 5 inch chain assembly and a 12 foot chain assembly. 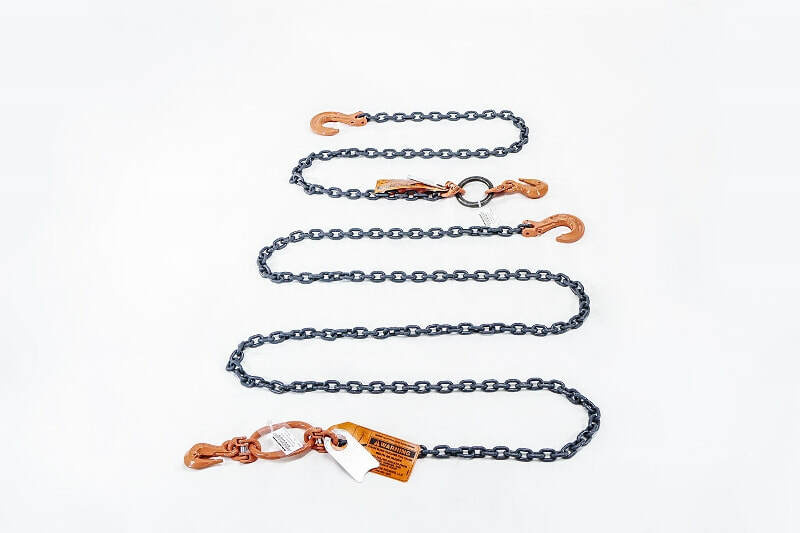 Each chain assembly is constructed of a special herc alloy, heat treated 9/32”, Grade 100, highly flexible, high carbon alloy chain with grade 100 forged alloy steel rings and hooks. A chain and attached master link, rings and hooks is referred to as a chain sling. 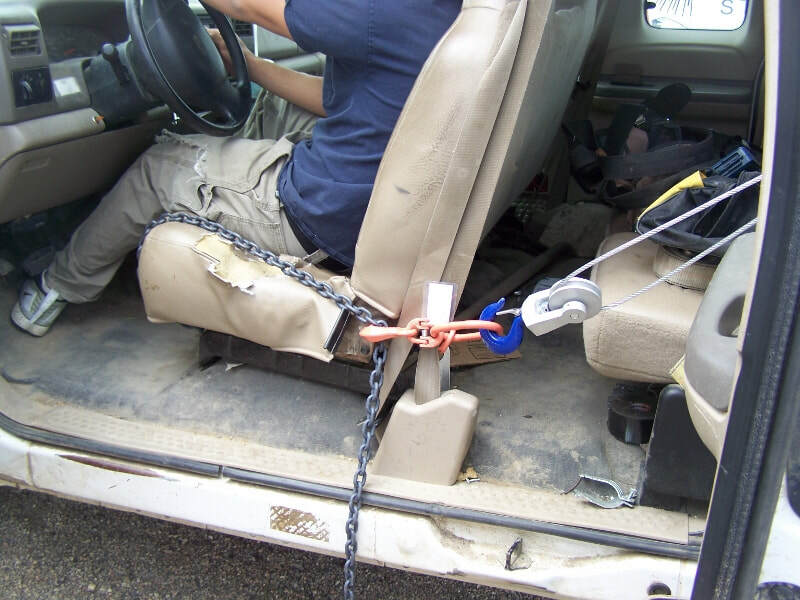 All of the components of a chain sling must be of similar ratings and the assembly is rated to the capacity of the weakest component. Each chain sling is individually proof tested and certified by a third party tester and identified by a serial numbered test tag permanently attached to the master link. The 12 foot chain has been designed with an oval ring adjacent to the adjustment hook for easy identification, while the 5 foot chain has a round adjustment ring adjacent to the adjustment hook. The large ring on the long chain sling and the small ring on the short chain sling provide easy length recognition and determination. The C-2A, 2 Ton Rescue Come-A-Long ™, frequently referred to as a cable puller, or a hand winch, is actually a hand operated hoist designed and constructed to meet the rigid specifications of, and approved for use by EMERGENCY SQUAD TRAINING INSTITUTE, inventors and designers of the highest quality, American Made rescue and extrication equipment. This heavy duty hoist is designed for both pulling and overhead lifting. this hoist is specifically designed and constructed to meet the demanding requirements of extrication and rescue professionals. The C-2A, 2 ton Rescue Come-A-Long is manufactured to exacting specifications, utilizing a high strength cast aluminum alloy housing with stainless steel springs, self lubricating bearings, extra flexible galvanized steel aircraft cable and three 360 degree swiveling hooks constructed of drop forged steel. The steel hooks are equipped with safety latches for positive load engagement. All C-2A Rescue Come-A-Longs are manufactured in the United States to stringent ISO 9001:2008 Standards, and ASME/ANSI Standard B-30.21. 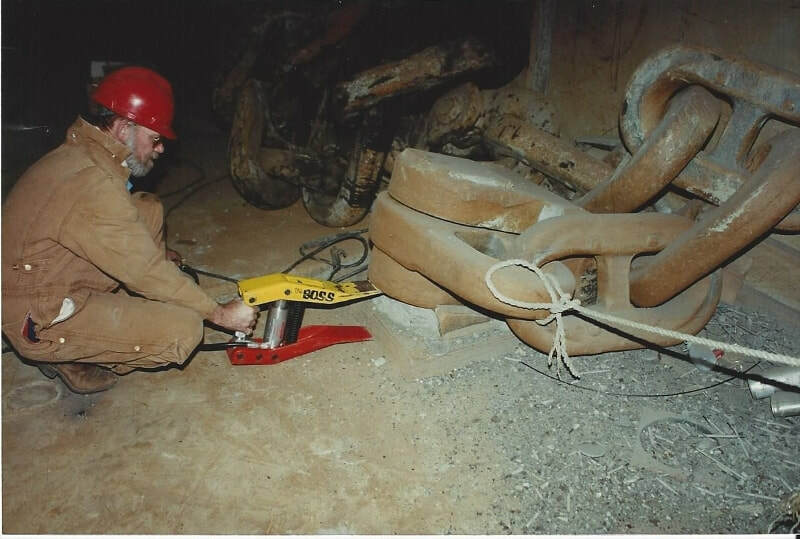 Every C-2A, 2 ton Rescue Come-A-Long is non destructively factory proof tested to 150% of rated working load and the unique ball shank cable retention system allows full extension of the cable unlike our competitors who only test to 125% of rated working load and require two or three wraps of cable to remain on the drum to achieve rated capacity. The C-2A, 2 ton Rescue Come-A-Long is a heavy duty rescue hoist designed for the demanding requirements of rescue professionals. This is not to be confused with an imported or hardware store type hand winch! The C-2A Rescue Come-A-Long utilizes a proprietary, quickly reversible, handle designed to switch positions in seconds, allowing for a downward pull when lifting or moving an object or load. The handle may be inserted into the bale from either direction, permitting easy access and operation in tight places. The handle can be easily removed to prevent tampering with the hoist or load. The easily replaceable handle is designed to bend at 125% of the rated capacity of the hoist to provide the operator with a visual warning that the Come-A-Long has been over loaded before the internal components of the Come-A-Long are damaged. Two handles are included to allow an immediate return to full service capacity after the load is reduced. Removing the track on a bulldozer.